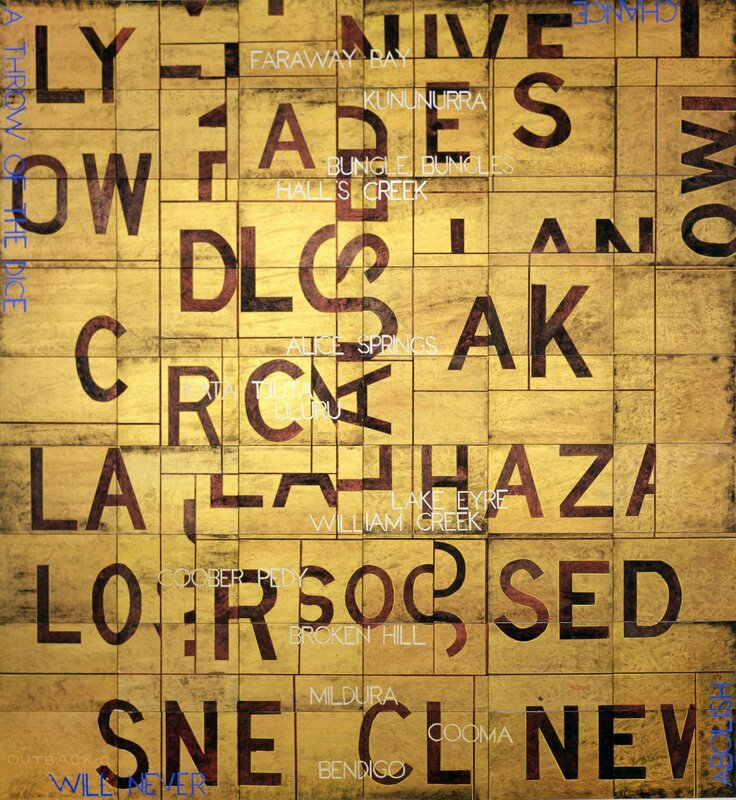 I. Tillers, Imants Tillers: Land Beyond Goodbye, Sydney, exh. cat., illus. "The Outback paintings refer to the spiritual heart of Australia and my imagined relationship to this 'unsolved' heart, for I was born in Australia and Australia is my homeland. The names of towns and localities present in many of these works, like William Creek, Lake Eyre, Broken Hill, Coober Pedy, Kata Tjuta, Kununurra and Faraway Bay, I use as a kind of readymade poetry. 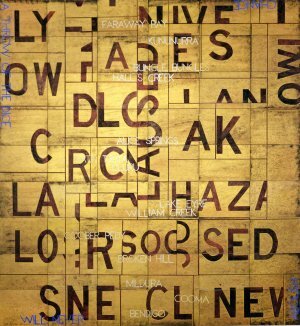 They are also places I have visited on my 'unfinished journey'"
Imants Tillers is among Australia’s greatest and most renowned postmodern artists. Born in 1950 into a Latvian family, Tillers’ work often centres upon a sense of place and the meaning of home to migrants, the displaced and the place of the ‘other’ in a multicultural society. The appropriation of other artists’ work, the dialogue between text and image in his paintings, and the monumental scale of his compositions all combine to produce an oeuvre that is both distinctive and highly resonant with Australian and international audiences. A conflicted sense of home and identity manifests itself in Tillers’ practice. Since 1981, the artist has produced paintings comprised of small numbered canvasboards. Known collectively as ‘The Book of Power’, the works frequently appropriate other artists, especially canonical works of Australian landscape painting. In borrowing the original sense of place felt by colonial artists likeEugène von Guérard and John Glover, Tillers is able to challenge those initial impressions of Australia by juxtaposing their famous paintings with extracts of text that carry contemporary political and spiritual messages. Tillers has been exhibiting for five decades, including representing Australia at the 42nd Venice Biennale. Most recently, in 2018, a major solo exhibition of his work, Journey to Nowhere, was staged at the Latvian National Museum of Art. He lives and works in Cooma in southern New South Wales. Tillers is represented by Roslyn Oxley9 Gallery, Sydney and Arc One Gallery, Melbourne.